Al-Razi, or Abu Bakr Muhammad ibn-Zakariya al-Razi, known simply as Rhazes in the Latin West, was born in the Persian city of Rey around 854, and died there around 925 – 935. In fact, “Al-Razi” means that he was from the city of Rey, which is a Persian city on the famous Silk Road, not far from present day Tehran. He is generally regarded as being one of the greatest Muslim physicians and medical philosophers of the medieval era, on a par with Avicenna himself. Like Avicenna, who came a century later, Al-Razi was not just a physician, but also a philosopher and polymath, distinguishing himself in many fields besides medicine, such as music and alchemy. Like Avicenna, Al-Razi’s medical works and treatises were highly sought after, and translated into Latin for the benefit of European physicians and medical scholars everywhere. First among Al-Razi’s major works were two medical encyclopedias. The first was Kitab al-Hawi fi-al Tibb, or “The Comprehensive Book on Medicine”; this was translated into Latin under the name of Liber Continens by Faraj ben Salim, a Sicilian Jewish physician and translator of medical treatises who was in the employ of Charles of Anjou. The second major medical compendium of Al-Razi was the Kitab al-Mansuri, known in Latin as the Liber ad Almansoris; it was dedicated to his patron, Mansur ibn Ishaq.It was translated into Latin in Toledo by Gerard of Cremona in the 12th century. The next most important medical work and breakthrough by Al-Razi was the Kitab fi-al Jadari wa-al-Hasbah, a treatise on smallpox and measles, which was the first medical work to clinically differentiate the two diseases. Al-Razi distinguished himself in many other fields of medicine as well, including ophthalmology, pediatrics and neurosurgery. In his youth, Al-Razi moved to Baghdad, where he studied and practiced medicine in a hospital there. He was then invited back to his native Rey by its governor, Mansur ibn-Ishaq, who became his chief patron, to start and head a hospital there; Al-Razi woud dedicate two medical treatises in his honor. Due to his newfound popularity as a physician, Al-Razi was later invited back to Baghdad, to be the director of a new hospital opened there. Al-Razi’s medical lectures drew many students, and he was considered as a shaikh, an honorary title given to a master teacher. As a teacher, Al-Razi was surrounded by both an inner as well as an outer circle of students. Those who came with a medical problem were first directed to the students of his outer circle, and if they could not solve the problem or provide assistance, the problem was given to the students of his inner circle. Finally, the most difficult medical problems, which had confounded all his students, went to Al-Razi for deliberation, and hopefully, a resolution. In his later life, Al-Razi struggled with eyesight problems, which started with cataracts, progressed through glaucoma, and finally resulted in total blindness. There are a number of different theories as to what the initial causes of his eyesight problems and blindness were. Some say that a heavy blow to the head by his patron, Mansur ibn-Ishaq, was the initial cause. Others say that it was from subsisting for too long on a diet that consisted entirely of beans. And yet others say that it was from caustic vapors or minor explosions that he endured while conducting his alchemy experiments. But whatever the cause was, the legacy of Al-Razi’s struggles with his gradually failing eyesight was that he became a recognized pioneer in the field of ophthalmology. Al-Razi was approached once by someone who wanted to sell him an ointment that he said would cure his blindness. When Al-Razi asked him how many layers there were in the eye and did not get an answer from the peddler, he declined his offer, saying that he would not have his eyes treated by anyone who was ignorant of their basic anatomy. Al-Biruni, another Persian savant and polymath who considered Al-Razi to be his mentor, wrote a short biography of his master, complete with a bibliography of his many works. Al-Biruni wrote that a former pupil of Al-Razi from Tabaristan came to look after him in his blindness, but Al-Razi simply rewarded him for his good intentions and sent him back home, claiming that his last days were approaching. According to Al-Biruni, Al-Razi died in 925 CE, at the age of 60. The Kitab al-Hawi, known in Latin as Liber Continens, is a large medical encyclopedia in nine volumes, the largest and most comprehensive written by Al-Razi. It is actually an expanded notebook of Al-Razi’s, which combined quotations and extracts from previous authors with clinical notes and his own personal case studies on the treatment of a wide variety of diseases. The Hawi is organized into separate chapters on different diseases, with special sections added, as necessary, to deal with special pharmacological topics and issues connected with certain disorders. Thanks to the Hawi, we have access to knowledge of early Greek, Indian and Arabic medical writings which are now lost, since Al-Razi was very meticulous in crediting his sources. Furthermore, the Kitab al-Hawi contains one of the greatest and most varied assortments of clinical case studies in Muslim medical literature. In the Hawi, Al-Razi criticized the views of Galen on the progression of fevers, as he had personally seen cases that did not conform to Galen’s patterns. Al-Razi also recognized that, when it came to urinary ailments, his own clinical experience far exceeded that of Galen. The Kitab al-Mansuri is a general textbook on medicine in ten chapters, which Al-Razi dedicated in 903 to his patron, the Samanid prince Abu Salih al-Mansur ibn-Ishaq. Translated into Latin in the twelfth century by Gerard of Cremona, it was extremely widely read and circulated throughout Europe. Chapter nine of this work, which deals with the subject of therapeutics, was often circulated and read on its own, under the title of Liber Nonus ad Almansorem. Even as late as the Renaissance, many editions of this work were printed, with commentaries on it by prominent physicians of the day, such as Andreas Vesalius. Al-Razi is generally recognized as the first physician and medical scholar to clinically differentiate smallpox from measles as being a separate disease. And Al-Razi uses the humoral principles of Galen to make this differentiation. Al-Razi considered smallpox to be basically an infection of the blood, in which the blood boils and releases vapors that get trapped in vesicle like blisters underneath the skin. He thought that the fluid in smallpox blisters was like immature blood being fermented and ripened into a richer blood, much like the making of wine, with the blisters being like bubbles found in wine. Characteristic of this treatise is its remarkable freedom from undue dogmatism and a Hippocratic reliance on clinical observation. The eruptions of smallpox lesions are generally preceded by continuous fever, pain in the back, and itching in the nose, and over the whole body; in addition, there are respiratory symptoms, like pain in the throat and chest, difficult breathing and cough. Restlessness, nausea and anxiety tend to be more frequent and pronounced in measles than in smallpox, wrote Al-Razi. Al-Razi introduced many practical and progressive ideas regarding medicine and psychology into the medical profession. He advised practicing physicians to constantly read and research the medical literature to keep abreast of the latest ideas and advances in medicine. Although he criticized charlatans who roamed the countryside offering their fake nostrums and “cures”, he maintained that some diseases were extremely difficult, or even impossible for even the most highly trained and educated doctors to cure. Into the incurable category he placed diseases like advanced cases of leprosy or cancer. Al-Razi also pitied physicians who had princes, nobility or women as their patients, because they would seldom follow through with dietary restrictions or other recommendations made by the physician. Although Al-Razi generally followed the humoral precepts of Galenic medicine, he had doubts about their veracity on certain points. For example, a medicine that was only moderately warm in its inherent qualities and temperament could, under certain circumstances, provoke a reaction from the organism that would release far more heat than that which was inherent in it. And so, Al-Razi noted a “chink in the armor” of the old humoral and elemental theories of qualities and temperament put forth by Aristotle and Galen, which could not be explained by those theories. In addition, some of Al-Razi’s own alchemical experiments had suggested that there were other key qualities inherent in matter besides Aristotle’s basic four qualities of the four elements; these other qualities he encountered included oiliness, sulphurousness, salinity and inflammability. As a medical progressive, Al-Razi came under frequent attack from the more conservative members of his profession for daring to question the old elemental and humoral theories of Aristotle and Galen. While acknowledging a great respect for, and indebtedness to, Galen, he felt that such respect did not, and should not, preclude him from discovering that which was erroneous or incomplete in Galen’s original theories. Al-Razi felt in his heart that Galen had chosen him for this difficult and controversial task, and that, if Galen had still been alive in his day, he would have approved of what he was doing. 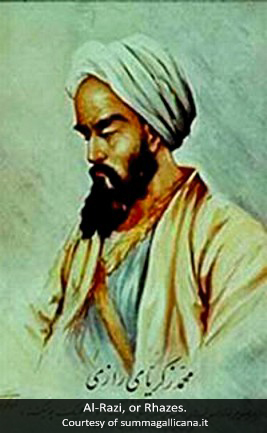 As a medical progressive, Al-Razi had great faith that new facts and data being discovered by the medical researchers of his day would ultimately lead them to a level of knowledge that was superior to that of the ancient authorities, and that we should not adhere rigidly or dogmatically to their theories. In this spirit, Al-Razi was actually being true to the spirit of Aristotle, who many regard as the first scientist. In the ninth century CE, pharmacy was just beginning to be recognized as a separate and distinct profession in its own right within the Muslim world, and Al-Razi was one of the first and greatest masters of pharmacy. Being an alchemist, he was not only involved in the quest to transform base metals into precious ones, but he was also a pioneer of chemotherapy, or the use of inorganic mineral and chemical substances in the art of healing, a science and tradition which continues to this very day in Unani and Ayurvedic medicine. Some of the mineral substances and preparations used by Al-Razi included various kinds of vitriol, copper, sal ammoniac, gold leaf, chalk, clay, coral, pearl, tar and bitumen. Al-Razi astutely observed and explained many chemical properties and reactions in a straightforward manner that was remarkably free from the usual alchemical mysticism and ambiguity, and developed several instruments which are used by chemists to this day. The development of pharmacy as a distinct profession took place under the patronage of the early Abbasiyyah Caliphs of Baghdad. The Arabic art of pharmacy was called Saydalah, and the ninth century saw the founding and increasing number of privately owned pharmacies not only in Baghdad, but in several other Muslim cities as well. While Western Europe was back in the Dark Ages, master pharmacists like Al-Razi were making significant contributions to the art of the apothecary, which included the preparation, compounding, storage and preservation of drugs in the form of pills, syrups, electuaries, etc… Government run hospitals had large dispensaries and drug factories attached to them, and government officials made periodic inspections of drug manufacturers and pharmacies, checking the accuracy of their measuring devices as well as the freshness and purity of the ingredients used. The foundation of Al-Razi’s healing system was dietary therapy, and the careful regulation of the patient’s diet – a principle that goes all the way back to Hippocrates, who advised us to let food be our medicine. Although Al-Razi did use compound preparations or medicinal formulas in his practice, he preferred single medicines, or at least simple medicinal formulas to complex poly-pharmaceutical preparations. But medicines were only a secondary line of treatment to be followed when dietary therapy alone was insufficient to effect a healing. Al-Razi was also a firm believer in the power of the mind, and a positive mental attitude, as a valuable ally in the healing process, and even wrote a whole treatise on the spiritual dimension of healing. Being a caring, compassionate soul and a medical populist, Al-Razi wrote a large medical self-help book entitled Man La Yahduruhu al Tabib, or, “He Who Has No Physician to Attend Him”. In the 36 chapters of this treatise, Al-Razi discusses and gives medical advice on the treatment of a wide variety of diseases, complete with herbal remedies and medicinal recipes whose ingredients are readily available in herbal apothecaries, the local spice market, or even your own kitchen spice rack, which can be taken with excellent results. These medicinal recipes and herbal remedies are of great interest to the medical scholar and historian, as well as to the pharmacist. Those who were unable to afford the professional fees he charged Al-Razi would treat for free. Al-Razi was a Hakim, which is much more than just a physician in the Muslim medical tradition; it also includes the distinction of being a medical philosopher as well. And as a Hakim in the Golden Age of Muslim science and learning, Al-Razi’s contributions to the field of medicine are fully on a par with those of the great Avicenna, who came a century later. Al-Razi also holds the distinction of being a major contributor to the art of pharmacy and alchemical medicine just at the time when pharmacy was coming into its own as a separate and distinct profession within the Muslim world – a development that would not be realized for another four centuries in Western Europe. In the early medical universities of Europe, Al-Razi, who was known as Rhazes, was probably the most widely read, consulted and respected Muslim medical authority besides Avicenna, and for good reason. Al-Razi and Avicenna were the two great luminaries of medicine in the medieval Muslim world, and the accomplishments and contributions of Al-Razi opened the door for those of Avicenna.